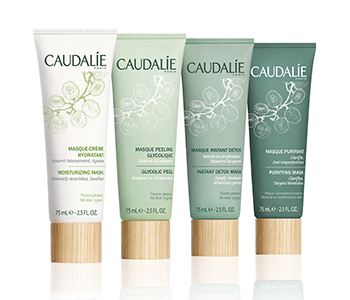 Inspired by their spa heritage, Caudalie's Mask Collection combines highly effective active ingredients with pampering, sensorial textures. The edited range of 4 supercharged masks enhance your skincare routine and target specific concerns. Soothe skin with the Moisturizing Mask, enhance radiance with the Glycolic Peel Mask, renew with the Instant Detox Mask; and clarify skin with the Purifying Mask. Mix and match the formulas to create a highly tailored spa routine, and reveal glowing skin.